The Fanatic offers decent value. With some surface tweaking, it can be that all-arounder you might be looking for in your bag. The Brunswick Mastermind uses the Relativity V Max coverstock along with the previously seen I-Block symmetric core from the C System Versa Max at an RG of 2.54 and diff of .052. As mentioned, Brunswick was looking to find a good all-around ball. I call these middle of the road balls that are very versatile and can be used on most typical house shots that bowlers are facing night in and night out. From Brunswick, The Versa-Max and Wicked Siege were those types of balls. Onto the Fanatic and lo and behold, Brunswick drops in the I-Block core from the Versa Max. With this cover and the factory finish, you get a clean look through the fronts and mids with a relatively smooth transition and good punch downlane. 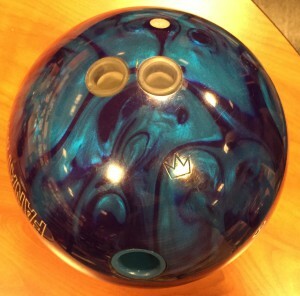 Out of the box, I see this ball as the “lower end” of the benchmark type reaction. It has a smooth and consistent reaction, but it is very clean. Maybe a little too clean for the ultimate benchmark…at least out of the box. That clean reaction can sometimes look “weak” downlane. That will be more pronounced for bowlers with lesser hand. In my estimation, any bowler type might find this ball touchy in the out of box surface. Bowlers with hand might find more over/under. Bowlers with less hand will find more under than over. In either case, tweaking the surface will likely give you a look. What we found in our testing was the Fanatic had no trouble finding the pocket consistently on this medium THS. However, we did see a share of ring corners. Again, I believe this is due to the clean finish on the cover. We also tested after a little breakdown. It still played clean. In the misses or mistakes, Brandon did see more under than over. It just seems to err more on that side and that’s not a bad thing. Just important to note. The Digitrax still shows an overall potent ball which was able to generate over 7 degrees of entry angle for Brandon from an average target of 18 at the arrows out to 5. We did not tweak the cover for testing but here’s the final take. Out of box, this ball has a nice smooth, clean look while still having good strength downlane. It will be versatile but we believe you will want to find the sweet spot of surface for your own game. It errs on the side of light a bit more than it being jumpy on mistakes. I say knock that factory shine off and given how great the I-Block rolls, you should find yourself a pretty good ball.